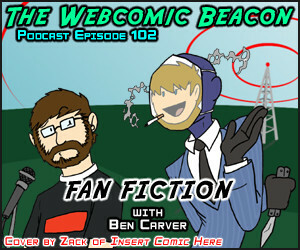 Ben Carver (Hero Academy) joins Fes, Tanya, and Mark to discuss Fanfiction. A little potential drama gets mixed in later, and Thom Katt calls in towards the end as well. Tanya gets riled up a lot, too! We broadcasted live with Ustream this time, and we’ll likely do it again. Cover Art by: Zack (Insert Comic Here). Rich Morris, The Ten Doctors, Sailor Ranko, 910 CMX, Little Kuriboh, Penguicon, Robot vs Jogging Girl. IN SPACE! 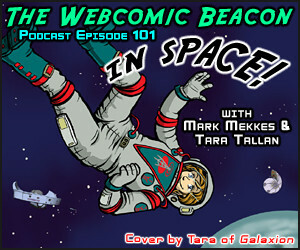 with Mark Mekkes (Zortic) and Tara Tallan (Galaxion) join Fes and Mark to discuss Science Fiction Webcomics, movies, and TV shows. Tanya was having headset problems but joined in the chat. Milestones: Avoid Spikes (2 yrs), Baron Von Douches House of Pancakes (100), Precocious (400), Smyzer and Blyde (1 yr), School Spirit (800), Tree Lobsters (1 year). Jump Leads, Jenny Everywhere, Star Slip, Station V3, Outsider, Marooned, Runners Universe, Moon Town, Dice Box, Alien Dice, Blank It, Surfboards and Rayguns, WC Fundraiser, Point Guardian, Out There, Life’s A Witch. Ben “BAR-1” Rodriguez (Peter is the Wolf), Jules Rivera (March Rocket), JinxTigr (Tally Road), and Zoe Robinson (The Life of Nob T. Mouse and All Over the House) join Fes, Tanya, and Mark to discuss a lot of things. 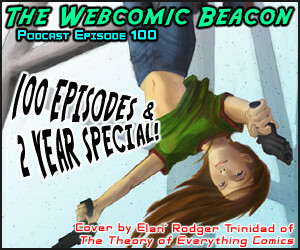 This is a celebration of 2 years and 100 podcasts for the Webcomic Beacon. This week’s cover is by Elan of The Theory of Everything Comics. See the full-sized awesomeness in the Guest & Fan Art Section! Milestones: Life’s a Witch (300). Also the winner of the Becky Card Contest is Alex Heberling (Garanos)! Midwest Furfest, Two Cents in Sixty Seconds, Girl Genus, World Steam Expo, The Webcomic Choice Awards, The Apple of Discord, Webcomic Planet, Weblog Awards, Penny Arcade, Blind Ferret Press, Penny Arcade Expo (PAX), Bite Me, W.C. Pope, Anti So Shell, Epic Fail, Trying Human, Papa Rabe, Julie Sydor (Song of Straygo), Jayden and Crusader, Dungeon Legacy, Insert Comic Here, Wagon Webcomic Battle, Sorcery 101, Sorcery 101 Graphic Novel on KICKSTARTER, Poorcraft, Jinxville, The Bess Effect, Naked Came the Webcomic.